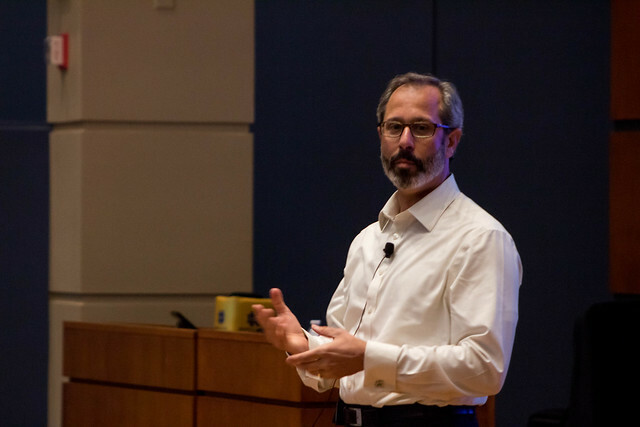 On Feb. 27, Brad Couri of Chicago Fundamental Investment Partners (CFI) hosted “An Introduction to Credit Investing.” The event was the fifth in this semester’s Robert K. Wilmouth Speaker Series, a number of lectures hosted by NDIGI designed to further students’ knowledge of the science and art of investing. The objective of the event was to explain credit investing and distressed investments and to educate students on evaluating distressed companies. Couri graduated from the University of Notre Dame in 1985 before earning his JD from the University of Illinois College of Law. He first began working in the field of distressed investments at First Chicago, where he served as a legal analyst. He soon transitioned to the business side, working as a managing director for the Bank of Montreal and then portfolio manager for the Citadel Distressed and Credit Opportunity Fund, Ltd. He finally co-founded CFI Partners in 2005, where he is responsible for firm-wide management and is a member of the Investment Committee. In addition to his role as Managing Principal at CFI, Couri serves as a member of the National Board of Bottom Line, an educational charity that provides career development and college access aid to underprivileged students, and as the Chair of the Board of Bottom Line's Chicago Region. Couri described distressed investing as “investing in bankrupt or near-bankrupt companies.” In order to fully understand distressed investing, he said, one must also understand the bankruptcy process. There are several reasons a company may file for bankruptcy. For example, their business may have deteriorated, they may have expanded too quickly, or they may have committed some form of fraud. The most common reason, however, is “overleveraging,” wherein a company has too much debt and cannot make its principal interest payments. They may have incurred this debt at a time when they were growing or assumed they could service the debt but no longer can. The company must then “restructure” their debt, meaning they must reduce their debt load often by converting all or a portion of their debt into new equity. Any existing equity in the company would then be severely diluted or expunged. A distressed investment, therefore, is usually an investment into a company’s debt that often becomes the new equity of the company when it emerges from bankruptcy. Couri explained the history of distressed investing through his own personal experience with its beginnings at First Chicago. It is a relatively new phenomenon, with its roots in the recession of the early 1990s, during which many companies suffered from deterioration and found themselves overleveraged. The early ‘90s also saw an “emerging market debt crisis.” For decades, American banks had been investing in bonds in Latin America. When the financial crisis hit these countries, foreign investors rushed to sell their assets. As a result of the convergence between the emerging market debt crisis and the recession, the distressed investment market began to flourish. He and his associates, along with other “vulture” investors, bought debt in these companies with the assumption that it would evolve into equity after the bankruptcy process, and the modern distressed debt market was born. After providing background about his fields of work, Couri then conducted a case study with those in attendance. He created a fictional company and explained that they had recently filed for bankruptcy. He provided a balance sheet and asked students to decide what they would pay for each of the company’s offerings and justify how they arrived at this valuation. He then gave his own individual valuations, educating the students on his professional assessment of a distressed company and informing them of the best methods for evaluating distressed securities. Couri informed students that credit investing is in no way a stable, linear market. He cautioned the audience to always be aware of the market’s current position in the cycle before executing distressed investments. Couri’s firm has recently partnered with the Academy Group, an enterprise that identifies extraordinary youths from underserved communities and invests in their education from elementary school through college. It provides its students with top-tier academic programs, college counseling, and internship opportunities. Its 2018 class consists of 300 students, and it expects a 2019 class of over 1000. The Academy Group established an ownership stake in CFI Partners, fueling expansion of CFI while also allowing the firm’s profits to fund the Academy’s academic programs. This mutually beneficial relationship is advantageous to both CFI and the students who rely on the Academy Group. Couri hopes this association will serve as a model for similar partnerships, creating a virtuous cycle that demonstrates the ability of investment to produce a social benefit alongside tangible profits.